The automobile market has been serving humanity for as long as we can remember-surely as early as before your great-great grandparents were born. Ever since the first automobiles were invented, people have been very keen on what automaker to trust, and that trend did not change up until today. If you are planning to invest on your first set of wheels and would like to consider a credible car make that manufactures top-quality automobiles for over a hundred years, there’s one name that you can trust-Chevrolet. Formally named the Chevrolet Division of General Motors Company, the Chevrolet (or ‘Chevy’ as they colloquially call it) is a known automobile division of the General Motors. GMC, being over a hundred-year-old car company has been manufacturing top-of-the-line automobiles since 1911. As a matter of fact, its tight competitor, Ford, was overtaken in terms of sales in the year 1929, using Chevrolet as the leading make in selling mainstream vehicles. Chevrolet automobiles are being sold worldwide. The word ‘suburban’ was formerly used by car companies to indicate a kind of vehicle is windowed with a station wagon-type of body and a frame that is commercial. In the year 1935, the first Suburban model was introduced. 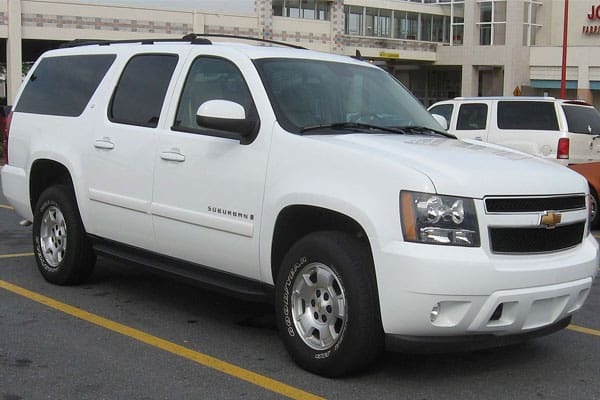 After twelve Suburban generations, along numerous remodeling and redesigning, now the Chevrolet Suburban is considered a full-size Sport Utility Vehicle that has an extended length. Tagged as the longest vehicle nameplate in automobile production, this model is undoubtedly one of GMC’s most popular automobiles. Now, if you are eyeing the best Suburban model yet, it is advisable to learn all about its latest version-the Chevrolet Suburban 2015. This article is dedicated to give you an unbiased and helpful review about the model. So, get ready and make sure you are taking pointers on why you should or should not purchase this Chevy baby. Don’t be impressively surprised, but the this ‘Burban version has a lot of good things in-store for you. It is packed with improved style, comfort, and better fuel and engine efficiency. But we’ll deal with those one by one as you continue to read this article-and while you are learning about the Chevrolet Suburban 2015, this model is currently being delivered to numerous car dealers around the globe. If you are the type of automobile owner who values aesthetic, you’d be glad to know that the Chevrolet Suburban 2015 is built with a strong butch beauty that showcases a truck-based automobile layout. Although there really is no huge redesign on its exterior, the 2015 model obviously looks tougher, chiseled, slick, and a sure head-turner. The vehicle possesses a tough character line that runs down on its side exterior just under the vehicle’s beltline. The hood was also built higher while the windshield is made flatter and a lot raked. With a highly angular built and that creased-and-pressed exterior, this model emphasizes a traditional yet innovative styling. This vehicle also boasts of brand new headlamps that function with projector beams. Even better, the lamps’ LED illumination gives a prominent both-end lighting. Compared with its predecessor model, the ‘Burban 2015 is, thankfully, about two inches longer, about an inch wider, and two inches lower. As for the exterior’s wheelbase, the Chevrolet Suburban 2015 is notably longer at 130-inch length compared to its predecessor model. Apparently, this model is slightly made longer overall (at 220 inches in length). The grille is built with simple yet tough-looking horizontal lines that embeds the prominent Chevrolet emblem on the middle. Its sheetmetal panels are made for strength-and are not the same with the Silverado model, but more like 2015 Yukon’s and 2015 Tahoe. Overall, you will surely love its square-jawed exterior. Going around the vehicle’s chassis side, the wheels are placed more precise with available sizes of 18-inch, 20-inch, and 22-inch in diameter. The wheels are more developed giving improved grip that reduces aid cornering and halting distance whilst maintaining the vehicle’s all-season capability. Aside from the improved body mounts, the Chevrolet Suburban 2015 also has aluminum front control arms and the rear axel location is more specified. Taking a look at the model’s interior, you’ll find it remarkably upscale-looking compared to its predecessor model. From a previous look that is more cliff-like and flat, the Chevrolet Suburban 2015’s dashboard is a lot improved with a better tough-looking carved design. The dashboard is also equipped with an LCD touch screen (8 inches) that is intentionally mounted at a higher level for your easy viewing. Below the LCD’s screen are arrayed infotainment controls for easy navigation, while the HVAC controls are placed just below. Even better, there is an extensive voice activation system that offers great functionality when you navigate the infotainment. More features are lined-up such as the following: keyless entry, cargo management system, ‘push-button’ start function, power tailgate, Chevy MyLink connectivity, BluRay DVD player (an option), and 1-6 USB ports and power outlets. Curious about the trims? That is something you’d like about the Chevrolet Suburban 2015. Included in the upper trim levels are high-quality yards of French stitching. Soft plastic and top-of-the-line materials are also used inside. As for the storage, it is safe to say that the ‘Burban is given a generous amount of it. Built inside the vehicle are two mid-level bins attached on the front doors and an impressively spacious central bin that is located just below the armrest that can be hanged with file folders. If you are a thriving firm owner or an office worker who’s always on the go for business meetings, you’ll find these features truly remarkable. However, you might be disappointed to know that as huge as the bins are made, the glove box is small. If you’re a driver with big hands, this might cause you a little problem. Taking the driver’s seat, you’d be glad to know that the steering wheel has a power tilting and telescoping function to give you a good driving position. Additionally, there’s also the pedals that are power-adjustable. Now, those are something that provide a good and comfortable driving experience. 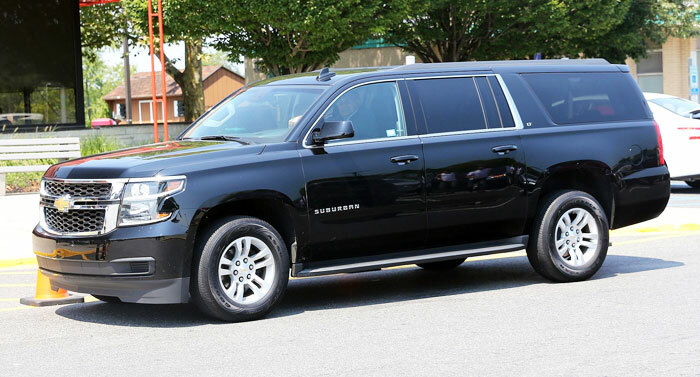 Another good point you’d like about the Chevrolet Suburban 2015 is its headroom and legroom in the front seats-these are increased in tremendous amounts. The seating space in the second and third rows are also partially increased. If you are driving without passengers and you’d want to make use of these second and third row space for a maximize cargo space, you just have to fold the seats by just pressing a button and voila, you get your space instantly. On the other hand, the seats are unfolded manually. Note: The third row’s fold switch is located in the luggage compartment. Because Chevrolet Suburban is known for being able to house many passengers, this trademark has to stay. Have you heard about the hassle of accessing the third-row seats on some earlier Suburban models? Well, GMC finally put an end to this issue by making the third row seat accessible through the back of the vehicle. This solution gives the second row more legroom. On the other hand, the third row is noticeably bigger, but is more suited for children or shorter adults. You might think that Chevrolet Suburban 2015 doesn’t have any drawback. Well, there is-and it is the added shelf (6-inch thick) on the cargo floor. It might be an additional storage for some, but for practical car owners, they would instantly know that this feature reduces the cargo space capacity at a notable level. Compared with its predecessor model that has a rate of 46 cubic feet of volume, it now dropped to 39 cubic feet just because of that shelf. But don’t blame the shelf for you will surely find a way to maximize the space or make use of that feature as you use your ‘Burban. Now, comes the detail you might be rooting for-the engine. If you’re expecting that the Chevrolet Suburban 2015 has a 6-cylinder with hybrid drivetrain and 6.2-liter V8 engine (which is the same as the GMC Yukon Denali), then get ready to have your bubbles popped. No, the new ‘Burban doesn’t have all these. Just like the Silverado model, the Suburban contains a 5.3-liter V8 engine that has an output of 355 horsepower. Along with that, it has a torque of 383-pound-feet that is passed on a 6-speed automatic transmission-and this is applicable whether it’s a rear wheel or a 4-wheel drive. Now, you might think that of all features, why would GMC change the engine? Thankfully, this change is for improved power output compared to the previous version. If you’re going to test drive this car model, you’ll realize that the new engine actually feels a lot stronger, gives better acceleration when driving on freeway, off-road, or even roads that require maneuvering. As for the gas mileage, Chevrolet Suburban 2015’s EPA slightly has slightly improved compared to its 2WD predecessor model 16/23/18. With a combined rate of 18 mpg, the ‘Burban 2015 only has the numbers increased to 15mpg on city driving and 22mpg on highway driving. Chevrolet claims that the Suburban is expected to be the vehicle that is most efficient along with its class-and this is true, all because of the deactivation of standard cylinder in replacement of direct injection. With normal driving, you’ll discover that this car has better gas mileage, while you might probably just be operating most of the time using just half of the cylinders deactivated. Even if you transition from V4 to V8, the changing of modes is surprisingly seamless, swift, and without any vibration or signs of crossover point. The vehicle’s electric power steering function also plays an important role in improving the gas mileage. Because of this function, plus the automobile’s high-quality steel and frame, it makes steering forces effortless at any speed. The Chevrolet Suburban 2015 suspension, on the other hand, stays with the leaf-spring design on the rear (just like the Silverado). If you’re going to purchase the Suburban LTZ, you can have the option of choosing the Magnetic Ride Control-a function that changes suspension damping rates through the use of magnetically charged fluid. Take note that this function is a good addition as it makes driving quality truly remarkable, swift, but with better control of the vehicle’s large frame. Even better, from a rate of 8000+ pounds, the Suburban can tow up to a whopping 8,500 pounds with this MRC! Beefed up safety is also one of the features the Chevrolet Suburban 2015 offers. GMC decided to put high-quality front-center airbags on Chevy models with front bucket seats. There are also other safety options like Adaptive Cruise Control and Lane-Departure Warning System (equipped with seat-mounted haptic alerts). Front parking sensors, forward collision alert system, and blind-spot monitors also come in the package. Another feature that might wow you is the head-up display. This function gives key details into your line of sight when driving. Adding to driver awareness and safety is the haptic driver alert system that is seat-mounted. Overall, in terms of performance, the Chevrolet Suburban 2015 is a good catch that promises strength, speed, comfort, and durability-thanks to the upgraded engine and other features. Now comes the verdict. Would it be worth it to purchase a Chevrolet Suburban 2015? At a base price of $48,950+ for 2WD LS model ($62,695.00 on LTZ, plus $3000.00 premium for a 4WD option to any trim level), you get all you need for an SUV-sleek and tough-looking exterior, generous seating capacity, luxurious interior equipped with useful dashboard and safety features, high towing capability, increased gas mileage, better grip on tires, and finally, a smooth yet optimum-performing V8 engine. What more can you ask for? Go to the nearest Chevy car dealer and purchase your very own Chevrolet Suburban 2015!